This past week was huge for the Federal Reserve. On Wednesday, the Federal Reserve kept interest rates at 0.25%-0.50%. The Fed also cut its outlook for the economy and the future path of interest rates. But it is this final projection, the so-called “dot plot,” that caught the attention of economists and Fed-watchers alike. 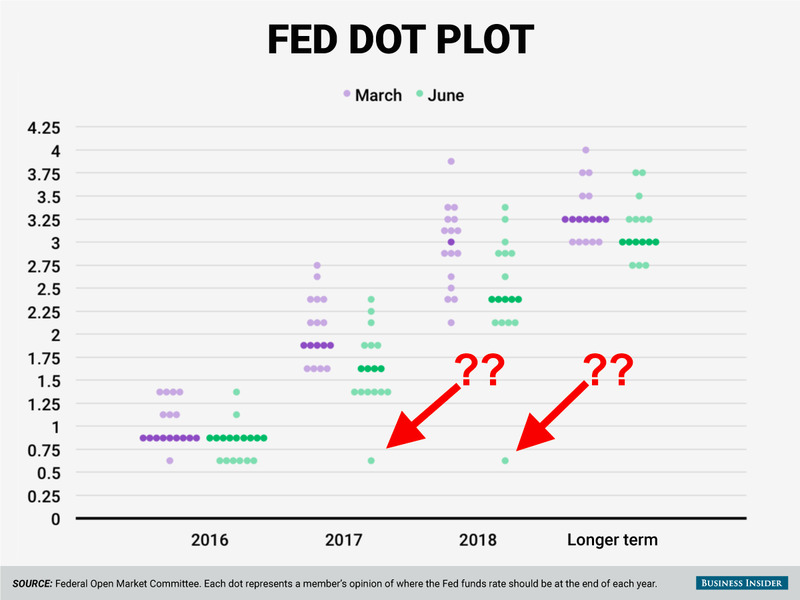 Notably, this plot contained two mysterious dots that forecasted just one additional rate hike for the Fed over the next two years. 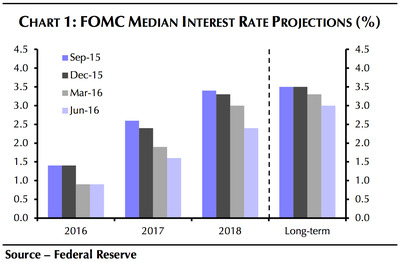 Other forecasts called for as many as a dozen rate hikes over the next couple years. And on Friday, the identity of the low dot was revealed: St. Louis Fed president James Bullard. But revealing the author of the dot (who also declined to give a forecast for rates over the longer term), is not nearly as big a deal as what the St. Louis Fed said in a paper outlining its new framework for understanding policy forecasts. 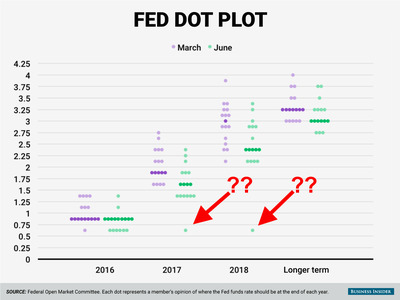 And with Bullard putting two outside-the-box projections on the latest dot plot, we now know someone inside the Fed will be advocating for an entire re-think of how the Fed conducts policy. Federal ReserveThese dots are James Bullard. So whereas traditional monetary policy forecasts assume a single terminal interest rate the policy goals should strive for, the St. Louis Fed’s framework says all we can know is what kind of current economic regime we’re under and target a terminal rate accordingly. In other words: all we know is what we know, the future is inherently uncertain, and most significantly, there is no natural state of the economy. In the St. Louis Fed’s world of 2% output, unemployment rates roughly unchanged from current levels, and inflation edging up towards the Fed’s 2% target but only slowly, benchmark interest rates simply will not need to go but 0.25% higher from here. The near-term impact here is obvious: the Effective Fed Funds rate is unlikely to go higher rendering all this talk about when the Fed will raise rates next more or less moot. Again, on Wednesday the Fed did cut its outlook for future interest rate increases significantly, but the upshot of St. Louis Fed’s analysis is that this doesn’t really matter. All that matters is what regime we’re in. And right now, that regime means lower rates. During her press conference on Wednesday Fed Chair Janet Yellen did speak to the inherent uncertainty in the Fed’s outlook, somewhat echoing comments made last year that any specific economic projection will turn out to be wrong. But the St. Louis Fed-recommended re-think calls not for an elimination of specific forecasts, but encourages forecasts be made inside a vision of what the economy can be right now, not at some point in the dreamed-up future. And this way of viewing monetary policy and the economy also calls into question ideas like “secular stagnation” which, while prescribing a current economic fate of low growth, also assumes a long-term future of higher growth rates. In the new narrative, uncertainty about possible medium- and longer-run outcomes is more explicitly taken into account. The economy does not necessarily converge to a single steady state, but instead may visit many possible regimes. Regimes can be persistent, as we think the current one may be. The timing of a switch to an alternative regime is viewed as not forecastable, and so we simply forecast that the current regime will persist. Policy is regime dependent, leading to a recommended policy rate path which is essentially flat over the forecast horizon. It would seem then that only by admitting you don’t know the future can you really understand the present. And so by calling monetary policy “regime dependent,” the St. Louis Fed is here arguing that policy ought to be conducted not with the aim of the Fed meeting its own (theoretical) goals. Much of the tension around Fed policy in the last, say, 18 months has been around its desire to raise interest rates because its longer-term target for rates was near 3.5%. In other words, a 3.5% Fed Funds rate is what the Fed thought should prevail eventually. But with inflation undershooting expectations and the economy growing at a mere 2%, many thought this an unrealistic goal. And the St. Louis Fed’s framework is saying it too agrees that a 3.5% Fed Funds rate is unrealistic. Which is another way of the St. Louis Fed telling its colleagues they’re doing it all wrong.